Kleine Einführung / Sugar of the Century, Bourgogne, Côte d'Or, Oktober 1999. Vogel & Fitzpatrick GbR Black Ink 1999. The Côte d'Or reaches out for a few miles between Dijon and Beaune. The name, reminding one rather of coast lines and sea, refers to the impression one gets when the leaves turn golden among the wide, vast vineyards. In the Côte d'Or Burgundy's most famous red and white wines are produced. For the red wines almost only Pinot Noir is used - for the more or less rare and simple Bourgogne Passetoutgrain Gamay is also grown. White Burgundies are made from Chardonnay. Besides, there is some for wines that are to be drunk fresh and young, and finally there is a bit of Aligotéand also Pinot blanc. Burgundy is one of the most complicated wine growing areas in the world. It has a treasure that is hardly to be overlooked. The government's regulations about the quality of wine are not measured by the natural sugar of the grapes or given to a certain owner. The vineyard's very position, the climate, is also judged. The different classifications start with the simple Bourgogne climate. Red and white Burgogne are grown. (Bourgogne Grand Ordinaire, Bourgogne Passetoutgrain, Bourgogne Pinot Noir, Bourgogne Chardonnay and Bourgogne Aligoté). The next set of classifications are the climates of the villages (Villages-climates which are added to the appellation of a certain village (e.g. Gevrey-Chambertin, Chambolle-Musigny, Volnay. They are followed by the names of several climates of the villages which are recognized as Premier Cru (e.g. Chambolle-Musigny 1er Cru Les Cras) and finally by altogether 32 Grand Cru-climates of the Côte d'Or (e.g. 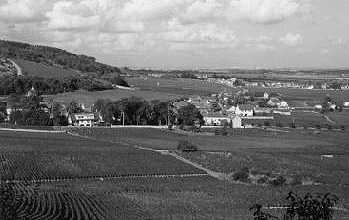 Musigny, Richebourg, Chambertin) - - so to speak, those partitions of the several slopes that are recognized as yielding the greatest wines. Viele dieser Lagen sind Many of those climates were spread among several owners. Therefore it is additionally of great inportance to judge the quality of the several products of a vinter. That is why there are many producers, e.g., of the great Grand Cru climate Corton- but just aside, there are others who make a rather simple Corton wine. The system of classification in Burgundy judges the terroir the soil and the unique characteristics of the terroirs. This should mark out Burgundy's successful wines and is supposed to be one of the major attributes to enable one to distinguish between several appellations.